The Bad Kitty Bakery: Tuesday Recipe Time!! I can’t stop. I might need to find some form of 12 step program. I cannot stop using my Zoku. Since Patti got it for me, I have been making at least a batch of six pops a day, and I am thinking about getting another set of sticks and another case so I can ramp up production. All this might have something to do with the fact it is 110 degrees here, and the Zoku makes pops that are low calorie, light, and refreshing. Of course, it does not do this on its own, it needs you there to pour in the mixtures, inset the pop sticks, and talk to it lovingly while it freezes them for you. Wait, you don’t need to do that last part? Today I made yet another batch, and they were the best yet, according to Jason. My husband gets lots of credits for being my brave Zoku tester. Even my bachelor friends are super excited. I showed them the case and told them they could help themselves. There were lots of happy faces for that! After all, what is better than playing a great role playing game and nibbling an icy treat? Place all ingredients in a blender. Blend. 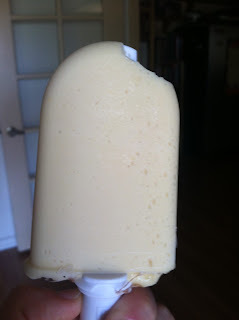 Use with your Zoku according to manufacturer’s directions. Makes 6-7. About 60 calories each, with 1 gram of protein and about 1 gram of fiber. NOTE: The guar gum will be in the baking section of the health food store, or you can grab it online. It is a little bit of an investment, but one bag will last you for years and years. By adding it to the mix, you are adding fiber (1 teaspoon = 9 grams fiber) and it helps reduce the ice crystals, which results in a creamer pop. You can skip it, but your ice pop will be harder and less creamy if you do. Hope you are enjoying my Zoku adventures. Don’t worry, upcoming blogs will eventually feature things that are not icy little treats of joy, but right now I can’t get enough.